Lynn Savoie is one of those people who had long draped her friends and family in homemade baked goods during the holidays. Positive reception eventually led Savoie to begin selling special orders of her treats. In 2014, she launched an official business, focusing on raw sugar toffee as her product of choice. Her husband, Lewis Savoie, comes from a line of sugar cane growers and producers in Assumption Parish. Lynn had regularly sourced raw sugar from two Savoie family sugar mills, Lula and Westfield, for baking. Savoie named the company after her daughter, Margaret Richardson Savoie, shortening the name to Maggie Richardson’s Raw Sugar Toffee. Savoie offers three signature selections: milk chocolate pecan, dark chocolate almond and white chocolate cashew. She also makes seasonal flavors, including a King Cake Crunch and Zulu Toffee Crunch for Mardi Gras. Raw sugar, Savoie says, gives the toffee a deeper flavor. Its unrefined crystals are slightly larger than regular sugar, and they retain a thin layer of molasses. Using it takes a careful hand. She combines the sugar with butter, stirring and gently boiling until the consistency is right. Once the toffee base is complete, she pours it into sheet pans, adding different chocolates and nuts. The slabs are chilled until hard. She breaks it by hand or with a vintage toffee hammer. The line is currently sold at Alexander’s Highland Market, Billy’s Boudin in Krotz Springs and Scott, at Oak Alley Plantation or by special order. Savoie will roll out her annual Easter-themed toffee soon, followed by purple and gold Tiger Toffee for football season. Following big Christmas sales last year, she is evaluating her next steps, including how to grow capacity. So far, she’s been able to pull off impressive volumes while also working full time planning special events for Franciscan Missionaries of Our Lady Health System. 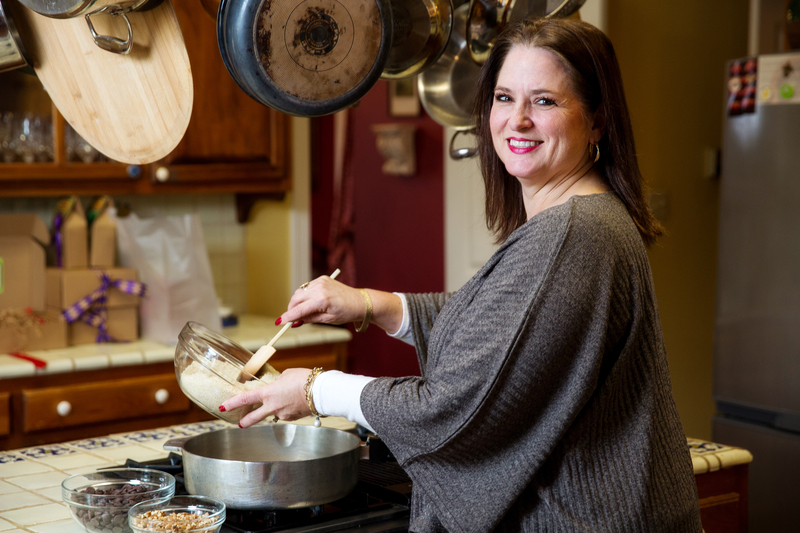 In December, she made about 600 pounds of toffee largely between 2 and 5 a.m. before commuting to work in Baton Rouge from her home in Clinton. Editor’s note: 225 contributing writer Maggie Heyn Richardson is not related to the owners of Maggie Richardson’s Raw Sugar Toffee. The matching names are just a weird coincidence! This article was originally published in the March 2018 issue of 225 Magazine.